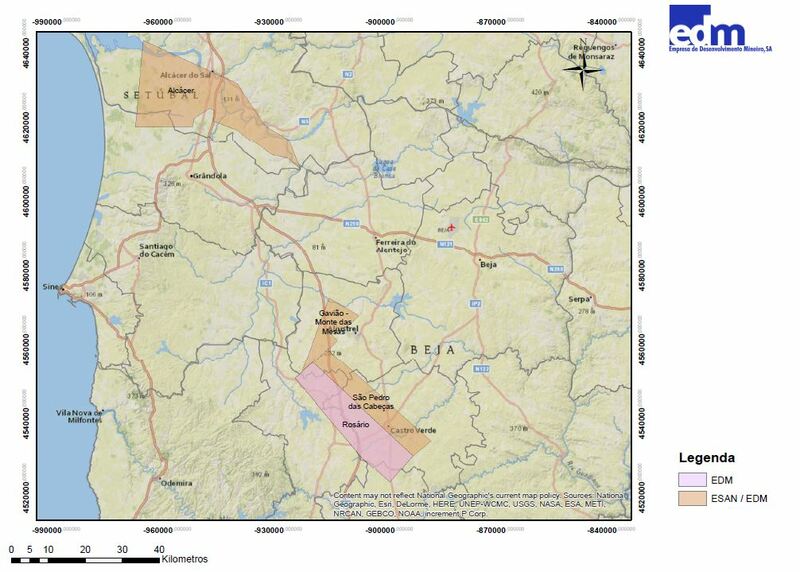 In February 2016, EDM signed, with ESAN, a Turkish firm, a Joint Development Agreement covering the areas of Monte das Mesas, São Pedro das Cabeças and Alcácer. The scope of the contract made with ESAN implies that EDM has 15% of this consortium, having been contractually established that the investment to be made by ESAN amounts to 7.6 million euros, which corresponds to its share in the consortium. EDM’s share is related to the investments made up to the date of signing of the respective consortium agreement, which means that EDM does not need to make any investment until ESAN completes the value agreed. The Monte das Mesas concession for prospecting and research is located in the NW part of the Messejana fault. 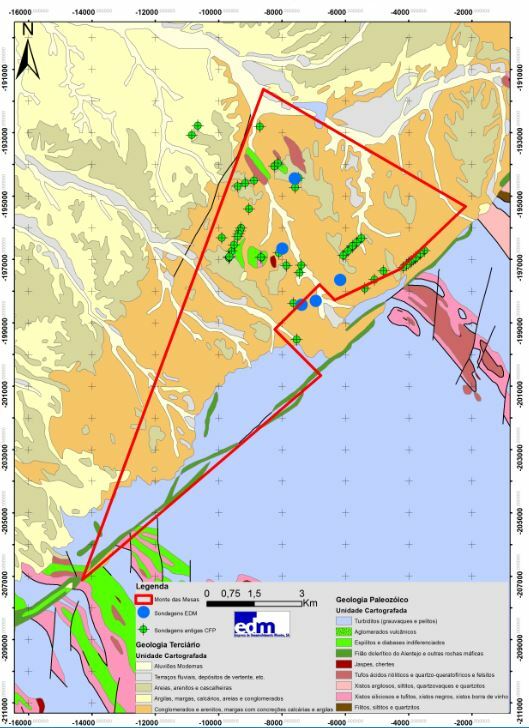 The favourable geostructural background of the occurrence of polymetallic massive sulphides, as well as the existence of geophysical anomalies detected during the various prospecting programmes, led to increased interest in this area, which is why it was decided to gain further knowledge of the area to the NNE of the Gavião concession and consequently find out whether there are mineral deposits that may be explored. The prospecting and research agreement relating to the Alcácer area was signed by ESANMET, a company 100% owned by ESAN, on 23 November 2016, with the Portuguese State. It has a surface area of 344.33 km2 and is located in the municipalities of Alcácer do Sal and Grândola, in the district of Setúbal. The surface geology that is observed in this area is dominated by the Tertiary sediments from the Sado Basin, which cover with variable thickness the Paleozoic rocks of the Iberian Pyrite Belt (FPI) and rocks of the Mértola formation of the Baixo Alentejo Flysch Group (BAFG). In this area some “windows” have been identified where Paleozoic rocks can be observed, particularly the windows of Valverde and Pedrogão, among others. The prospecting and research agreement relating to the São Pedro das Cabeças area was signed by ESANMET, a company 100% owned by ESAN, on 23 November 2016, with the Portuguese State. It has a surface area of 133,175 km2 and is located in the municipalities of Castro Verde, Ourique and Aljustrel, in the district of Beja. The potential of this area lies in the fact that it is a parallel structure very close to the Neves Corvo-Rosário antiform where the Neves Corvo Mine, and several other historical holdings for copper and manganese, are located. The structure of Castro Verde is little known in depth, as only 7 mechanical probings have been carried out, and some geophysical anomalies that require further investigation have been identified.